Make these Spider Crackers for your little one's Halloween Party. If you've got a kid who isn't keen on carrots, try serving them undercover as spiders' legs and heads with these cute Spider Crackers. Place 2 process cheese piece between 2 crackers. 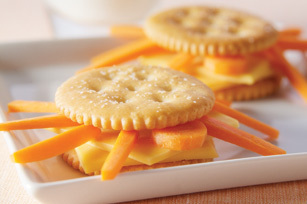 Arrange 4 long carrot strips around crackers to resemble 4 "legs." Add 1 short carrot piece for the "head." Prepare as directed, using RITZ Reduced Fat Crackers. Have fun making these cracker critters with your kids and then teach them about portion control.